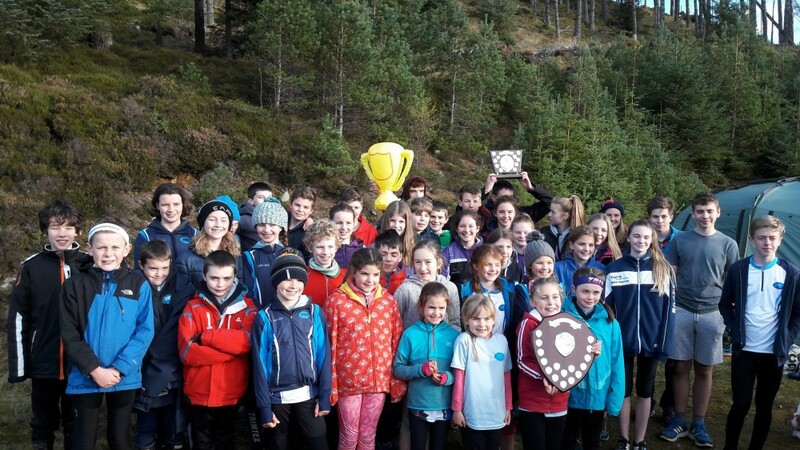 Round up of the Junior Inter Area weekend by Kat McGougan. The Junior inter areas is an annual competition where Scotland is split into 3 areas: North, West and East. BASOC competes for North, and after a narrow defeat last year, we were keen to win back the overall title! Kat, Alice and Rosie travelled down to Livingston on Saturday to take part in the relays, where you are put in teams mixed with people from your area. With the legs being orange, yellow and light green, every team was really mixed and a good opportunity to get the team spirit going! After some team warm ups, the Open Relay were ready to set off. This was my first relay so was really fun to try out and will definitely do another in the future. I was the first leg running an orange so it was nerve racking yet exciting standing on the start line. I had lots of fun making lots of friends on all of the different teams. After a close sprint finish, North won the open class, with West coming in 2nd and East coming in 3rd. The relay is such good fun as you'll meet new people from different teams. I was the last racer and it was cool to see the others run and come in. After 2nd leg runners coming in very close together, it was all to play for the girls title. Unfortunately West were just too quick and meant that the girls podium was: West (1), North (2), East (3). (Editor note: Kat ran a speedy last leg to bring the West team back into 2nd position, holding off many girls who were hunting her down!) This meant that along with the other results, West was in the lead overall, but we were determined to get those extra points back in the individuals! All the teams stayed together in Stirling Youth Hostel - we filled it all! In the hostel we were spilt into people within the same age category from the other areas and it was good to meet them and make new friends. After an excellent dinner, quiz, and a good sleep, everyone was ready to go for the individual race, and final Scottish orienteering league (SOL) of the year. The area, Drummond Hill, was a new one for many, and despite it being pretty chilly, everyone seemed to really enjoy the event. It was hilly, ‘runnable’ and had some stunning views of Loch Tay and the nearby hills; what’s not to like?! After some awesome runs from lots from North (particularly the younger ages), we managed to comfortably beat East and West in the individuals and consequently the overall InterArea trophy. Yayyyy!! This event is very unique in the fact that beginners and the most experienced juniors in Scotland get to meet, stay with, and compete against each other with no added pressure. Everyone looks forward to it, so we will definitely be looking to put in a big effort to get as many people as possible from BASOC there next year. I know I’m already looking forward to it! A huge thanks to all of the organisers, helpers and of course, our fab coach Jess, as without them, this weekend would not have been able to happen.